Lowering operating costs and preventing N.O.V. 's (notice of violations) are what process engineers look for everyday within their pH neutralization systems. Some pH neutralization applications can be accomplished using pre-designed systems, but here we find that most applications require some level of customization. At Wastech, we have a full engineering staff of chemical, electrical, mechanical, and control engineers giving us the power to design a complete custom solution for any of your applications. Wastech's Laboratory series of products offer solutions for the most common types of laboratory wastes by neutralizing acidic or caustic wastewater. All of which provide fully automated on-site treatment as an economical alternative to waste collection and off-site disposal. Wastech manufactures a series of batch pH neutralization systems that treat intermittent flows of acidic or alkaline wastewater for industrial applications. These systems treat wastewater by adjusting the pH to a neutral range, typically between 6 and 9, before discharging the water to the public sewer. For large flows, Wastech designs continuous treatment systems that can provide pH adjustment using single stage, two stages, and three stages treatment systems. These series of pH neutralization systems can be skid mounted for ease of installation and customized depending on customer needs and available area. Reliability, automation, and great process performance are essential at all times, even in the presence of strong acids or caustic surges. You will not find pH neutralization or pH adjustment processes using better components or as many high-end features, functions as offered standard as in a Wastech pH system. The finest quality in control panels. As a CSIA Certified Control System Integrator, Wastech builds UL-labeled panels with CAD wiring diagrams, labeled and color coded wiring, and using quality components. 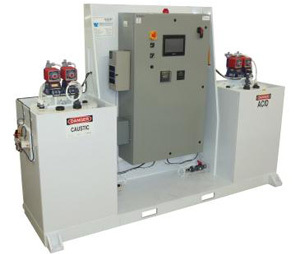 Our control panel workmanship bears our signature and is unequaled in the process industry. Advanced software control. As an expert in process integration and wastewater treatment design, Wastech has developed custom application software for automated and predictable control for acid neutralization systems. The application includes advanced pH control and alarm management capable of handling multiple-stage operation. There is nothing like it in the market place. available in 10, 20, 30 and 50 gpm sizes. Single, two, and three-stage systems for extreme waste conditions can be designed. Higher flow rates up to 1000 gpm are also possible. Batch process neutralization (OMEGA Batch Series) available up to 2000-gallon batches. Chemical feed day tanks of all sizes including drums and IBCs. Chemical metering pumps - industrial quality. Influent flow indicators or meters. Rugged industrial pH sensors, monitors and controllers. NEMA-4 or 4X control panel with relay control or PLC control. Skid-mounted on epoxy-coated steel or custom fabricated PP. Industrial quality mixer - single-phase or three-phase. pH chart recorder or data logger. Documentation package including drawings and O&M manuals. Complete automation with custom PLC software. pH control panel upgrades or replacement to existing systems. Custom alarms to beepers, SCADA or dialer. Flow switches or flow totalizers. Low level switches for chemical feed tanks. Secondary contained tanks with leak detection alarms. Double containment piping and tubing. 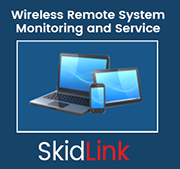 Data logging software for PC monitoring. Communication options including wireless, Ethernet, or DeviceNET. For more information, see OMEGA Neutralization System Features. Available for batch neutralization or continuous neutralization operation. Ideal for chemical labs in universities, high schools and research facilities. Small, automated packages from 2 gallon batches to 3 gpm continuous systems. For strong and concentrated acid neutralization applications where safety is of concern. Applications with 10 to 50 gpm flows. Applications up to 200 gpm flows and custom design. Designs with relay controllers or PLCs for single or multi-stage neutralization systems, Zeus™ software for PLC designs. Monitor & record pH for most existing flows. See Specification for Model 640-375.